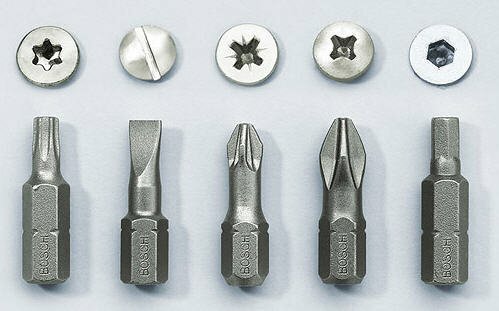 Screwdrivers are the basic tools for rotating screws with special slots of different types in their heads (screwing and unscrewing operations). A screwdriver amplifies the hand's turning motion to the small, specially designed working part (tip or blade) that is inserted into the screw's head. Typically a screwdriver consists of two parts: a handle on the one hand and a blade on the other. Instead of the handle there might be motorized rotating means to make the task of a person working with the tool easier. Electric screwdrivers have become a popular type of power tools. The most important thing in using a screwdriver is to select the appropriate tip and size to fit the fastener's head. Never use the screwdrivers inappropriate to the selected type of screws. There are plenty of different screw type varieties, and apart from using the traditional slot, new types of screws and corresponding drivers are being invented from time to time. Most of the common screwdriver types, such as flat-blade and cross-recess, have an extremely wide range of applications. However, the less common types are more or less typical for a certain field. Some screwdrivers are designed particularly for portable device repairing (cell phones, smartphones, MP3 players, etc). Usually, the electronic device manufacturers nowadays use the screws of special star-shaped forms, patented as Torx and Pentalobe. We will have a closer look at the most widely used screw types and screwdrivers fitting them. Original and the most commonly used traditional screw type - it has a single slot in the fastener head. However, this screw loses the popularity, as it is the less reliable one - the screwdriver often slips out of the slot, and the chances to damage the screw or the screwdriver are very high. One more extremely popular screw type - a kind of cross-recess screw. Phillips drive sizes (different from the screw size) are designated 0000, 000, 00, 0, 1, 2, 3, and 4 (by order of increasing size). The design is similar to Phillips screw, however it includes 4 more contact points. It is a screw type popular in Europe. Pozidriv sizes are also similar to the Phillips ones. A hexalobular socket screw drive or a star drive uses a star-shaped recess in the fastener with six rounded points. A popular screw type in the field of electronics industry, for operation with automotive items and other applications. Torx drive sizes are designated T1, T2 (or T01, T02) to T55. Tamper-resistant Torx screw with additional protection from unauthorized access designed for applications where tampering could be a problem. 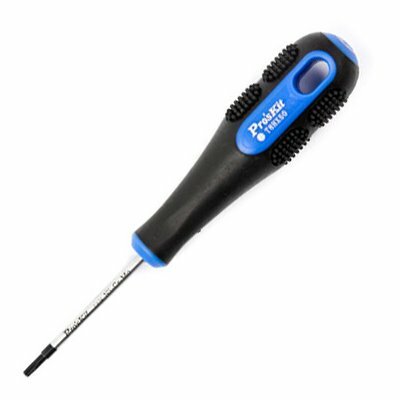 Tamper-proof Torx drivers and keys are applicable for unscrewing Torx screws. Common marking: TxH, where x is a drive size. Hexagonal-shaped screw that may be driven by a hex key or a hex screwdriver. It is also known as triangular slotted, is a screw with three slotted "wings" and a small triangular hole in the center. There is no family of products that necessarily uses tri-wing screw drives. Nintendo products have featured them in the past, however. In the present day it is usually used on electronics equipment. Tri-wing drive sizes are designated TRI000, TRI00, TRI0, TRI1, TRI2, TRI3, etc. It is a screw with two round holes opposite each other and is designed to prevent tampering. Sometimes also known as "snake eyes" and "notched." Spanner screwdrivers are typically used with electronics, stall doors for restrooms, elevators, trains. There are also several external drives characterized by a female tool and a male fastener: square, pentagon and hex. The most common external drive is a hex screw. It can be turned with an adjustable wrench, combination wrench, and 6- or 12-point sockets. Here is a table of the most commonly used screwdrivers. All the screwdrivers in the series are made of Ni-Cr-Mo steel and have an oxide tip. What is a precision screwdriver? Screwdrivers with particularly precise tips, specially sharpened for exact matching the screw heads of small and very small sizes are called precision screwdrivers. 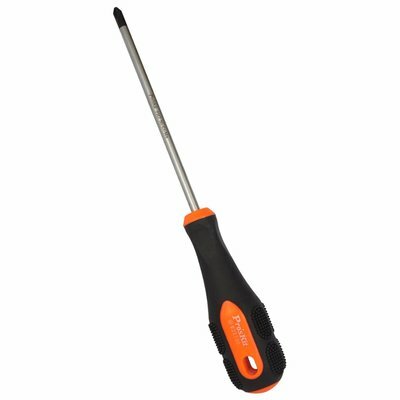 This kind of screwdrivers is used for components assembly / disassembly while repairing small devices and gadgets, such as watches, cell phones, cameras, portable computer devices and tablet PCs, music players, video games and other electronics. Traditionally precision screwdrivers and sets of such screwdrivers are used by technicians, a good set of screwdrivers is also a must for each workshop. A range of precision screwdrivers always includes the most commonly used types and sizes: slotted, Phillips, Torx, Hex. For some precision operations we need screwdrivers for special screws: TriWing, Pozidriv, Spanner, etc. Apple company uses a special tamper-resistant screw for its products, which may be driven with a five-pointed star-shaped pentalobe screwdriver. Torx screws are extremely popular in usage for precision applications, such as repairing computers, mobile devices, electronics, and more. Sizes: T1, T2 (or T01, T02) to T55. "Pentalobular security screws" system is being used by Apple in its products. Pentalobe screw sizes include TS1 (0.8 mm, used on the iPhone 4, iPhone 4S, iPhone 5, iPhone 5C, iPhone 5S, iPhone 6, iPhone 6 Plus, iPhone 6S, iPhone 6S Plus, iPhone SE, iPhone 7, iPhone 7 Plus, iPhone 8, iPhone 8 Plus, iPhone X), TS4 (1.2 mm, used on the MacBook Air and the MacBook Pro with Retina display), and TS5 (1.5 mm, used on the 2009 MacBook Pro battery). Tri-Point screws are used for assembling portable electronic devices. Apple company started using them in cell phones produced after iPhone 6, as well as Apple Watch. Common marking: TP / Y. Users often prefer screwdrivers from Pro'sKit, who have manufactured a whole series of precision screwdrivers: you may select a perfect set fitting your own needs. Pro'sKit SD-081 series contains the most commonly used screwdriver types, as well as some specific types for different specialized applications. You may have look at the products of this series in our comparative table. 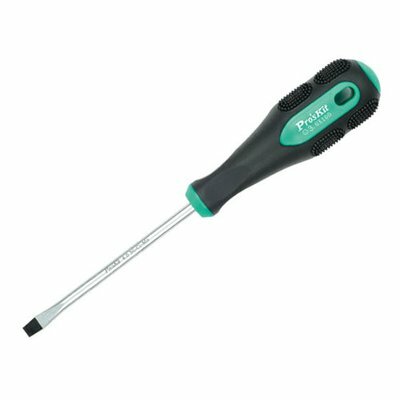 All the screwdrivers in the series are made of high-quality chrome-molybdenum-vanadium steel. Handle made of TPR and nylon does not slip in your hand and is equipped with a rotating cap for comfortable operation and to minimize your efforts. 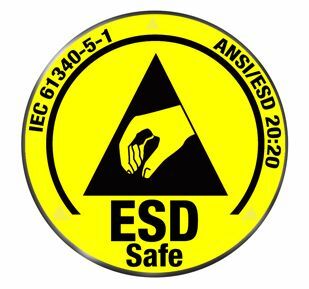 For operation with some types of radioelectronic components that are highly sensitive to static electricity you need tools with antistatic protection. 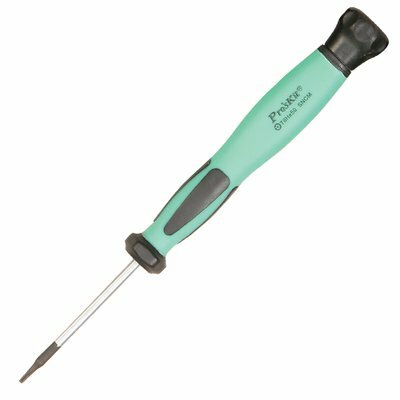 Among the precision screwdrivers from Pro'sKit there is a series of screwdrivers providing maximum protection from components electrostatic discharges. Apart from a wide choice of screwdrivers, manufacturers also offer special sets that make a task of the ordered screwdriver storage easier, while the sets consisting of a handle with interchangeable bits will even help save the valuable working space and make your tools really portable. Screwdriver bits may be also used with electric screwdrivers or drills. You may obtain more detailed information on the contents of such precision screwdriver sets and choose an optimal set with all the needed types of bits for you operation tasks in the comparative table of precision screwdriver sets, prepared by our technical experts.